Click on the photo and see all the photos of Coast Capri Hotel. WiFi available in all areas, Restaurant, Room service, Bar, Snack bar, Vending machine (drinks), Fitness centre, Spa and wellness centre, Massage, Hot tub, Outdoor pool (all year), 24-hour front desk, Express check-in/check-out, Safety deposit box, Luggage storage, ATM/cash machine on site, Babysitting/child services, Laundry, Dry cleaning, Meeting/banquet facilities, Business centre, Fax/photocopying, Shops (on site), Non-smoking rooms, Family rooms, Lift, Heating, Non-smoking throughout, Air conditioning, Designated smoking area. 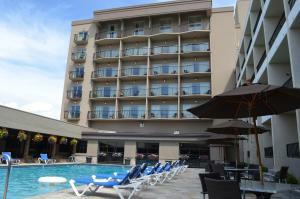 This downtown Kelowna hotel is just blocks from Okanagan Lake. It has 2 on-site restaurants and a spa. The warmly decorated rooms offer free WiFi. Coast Capri’s on-site spa, Beyond Wrapture, offers a variety of massages and beauty treatments. Other facilities include a state-of-the-art fitness center overlooking an outdoor pool and hot tub. The elegant Vintage Room offers a fine dining experience for dinner and lunch. Vinter’s Poolside Grill features live jazz and blues, and Coffeecopia specializes in coffees and snacks. Classically styled rooms at Coast Capri Hotel are furnished with a work desk and a refrigerator. Cable TV is also included. Kelowna International Airport is 12.6 km from Coast Capri Hotel. Knox Mountain Park is about 7 km away, and Kelowna Golf & Country Club is only 3 km from the hotel.